We hiked a mile from the shelter down to the Nantahala Outdoor Center (NOC) for a big breakfast at the River’s End Restaurant. It was nothing short of amazing and we both devoured the Class V breakfast, the biggest plate they had. I had sweet potato pancakes, bacon, eggs, toast, homefries, grits, and orange juice. I’ll admit, even if I wasn’t thru-hiking, I could probably come close to eating all of that food, but as a hiker, you don’t leave the table feeling bloated or guilty. Or at least that’s the only difference I felt. We had a long uphill hike today to Cheoah Bald. 8 miles uphill and 4013 feet of vertical gain. Holy smokes was that a climb and a half! There were several steep sections and there was still snow in some spots. By the time we reached the top, I was super tired. We were going to camp further down the trail, but the sunny bald and views from it were too good to pass up. I sat in the tent for awhile as the sun beat down on it. It was like a sauna in there, which was perfect since I’ve been cold in camp for days. Today was a tough day psychologically. The steep climbs all day, fatigue, and getting nervous about how cold and snowy the Smokies may be were all perfect reasons to call it a day earlier than we had planned. I’m thankful for the rest and I know my left foot is as well. 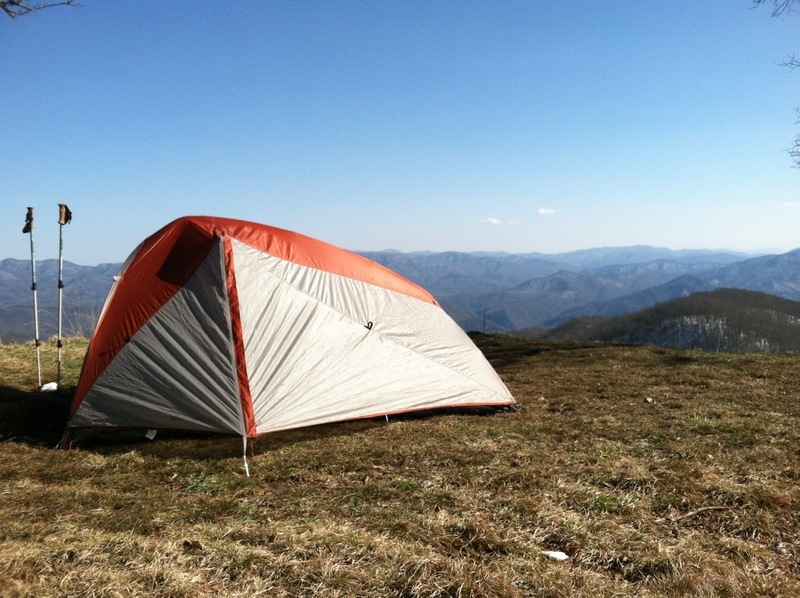 Here’s to hoping for a good night’s sleep and a beautiful sunrise view from the bald in the morning. This is by far the best camp spot yet. The Cheoah south side climb is like a tough one indeed but what a great payoff. Your snow hike must have been really awesome. When you get to Stecoah Gap, left down the road will get you in to Robbinsville (several miles). Nothing exciting there, food, hotel, grocery but no beer. It’s a dry county. One of the most difficult, daunting climbs of the southern Appalachians – congratulations: you’re doing it! So glad you are taking the time to ‘stop and smell the roses’! It looks absolutely beautiful! Enjoy! I’m really enjoying your journal. I spent a night on Cheoah too. I love the balds. I am a section hiker – been working my way north. Anyway, I think your doing great and have the perfect attitude for hiking the AT. Keep on truckin’,take care be safe!